You've seen Weapons and you've seen the Poor Man's Canvas Weapons....well if they mated you'd get today's Weapon Wednesday. I am calling these the Converse Weapon Slim, but that's just because I don't have an official name and that's the best I could come up with. These shoes are for those of you that like the look of the Weapon but don't want to feel of a basketball shoe. 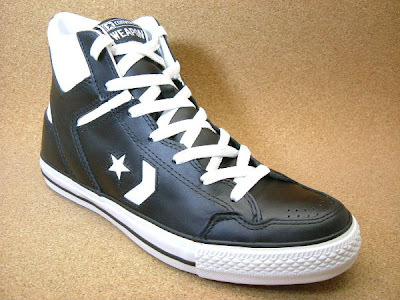 They're also for those of you that enjoy the Chuck Taylor mid-outsole but want a little more support for your ankles. Also these shoes are for everyone else, for various other reason. If you remember back a few weeks ago when I posted pictures from Elton Brand's initial photo shoot with 76ers...go ahead think back. At the time I questioned if Mr. 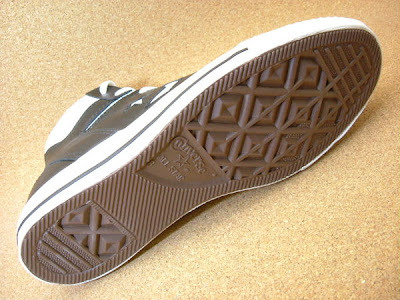 Brand was in fact wearing his own signature Converse shoe. Well it turns out that he will have his own signature and it will be sold at exclusively at JC Penny for $65. You can read more about it by going over to Dime Magazine. You'll also find a description of the EB logo, pretty cool. Well that's it for today, thanks to checking out the blog and don't forget to vote on your way out. Do you have any idea when, and where these will be sold? I must have them. 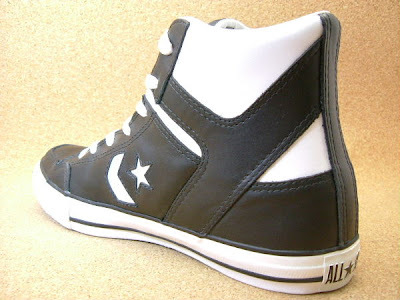 The Converse Blog: Converse Athletic Footwear! The Converse Blog: Saved By the Bell! The Converse Blog's Weapon Wednesday!